RIOS TAC2 - Front Angle with GUI. The RIOS Tactical Package integrates the RIOS TAC2 I/OModule and MIL-STD-810F RIOS Durabook Gateway Controllerwithin an FAA-compliant transit case. 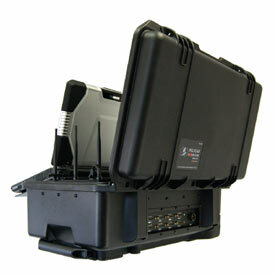 The rear-interfacing TAC2I/O Module provides eight high-density interface ports forinteroperable voice communications. The TAC2 interfaces toall types of HF, VHF, UHF, 700/800 MHz, cell phones and iDENhandsets and allows the operator to quickly interconnect themby means of the intuitive RIOS Graphical User Interface.On-board power management offers DC input with externallithium ion battery power to the I/O module and PC controller.Network options include LAN with Wifi and USB DataConnection. 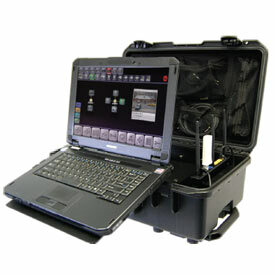 Tactical packaging includes a swing-mountlaptop platform and lid organizer. Additional options includecamera and RIOS Lite smartphone integration as well as options for remote radio control.